The fight against a crippling cholera outbreak has cost the treasury close to K1 billion, latest figures released by the Ministry of Finance have shown. In January 2018, the treasury released K35 million towards cholera control in addition to the K64 million which was released in 2017. 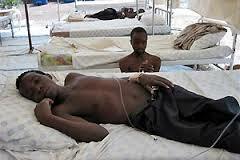 Zambia has been battling a serious cholera outbreak that has claimed 80 lives and seen over 4,000 people treated. Local Government and Housing Minister Vincent Mwale recently confirmed that some funds from toll gates and the 2018 allocation for Constituency Development Funds have been diverted to fight cholera. The Government has however failed to disclose how much it has received financially and materially from a flood of local and international donors to fight cholera. And the Treasury in January released a total of K5.2 billion of which K1.6 billion was for personal emoluments for public service workers, K1.8 billion went to debt service, and K1 billion was allocated for grants. The remainder of K0.8 billion went to other key programmes, including capital projects. The K1.6 billion expenditure on personal emoluments includes the 2018 wage increment awarded to public service workers in the month under review. Of the K1 billion grant amount to various institutions, K233.2 million went to the Ministry of Agriculture for the Farmer Input Support Programme while the Food Reserve Agency received K172 million as final installment for clearing arrears accumulated in the 2016/17 marketing season. The Treasury also released K89.9 million for the Local Government Equalisation Fund to fiscally empower local authorities and ensure equitable distribution of resources. The allocation for the Local Government Equalisation Fund has been increased by 21.5% to K1.1 billion in the 2018 budget compared to K863 million in the 2017 budget. Public universities received a total of K92 million. The University of Zambia received K33.4 million of which K16.7 million is for student loans and allowances, the Copperbelt University K38.3 million of which student loans and allowances was allocated K23.8 million, and Mulungushi University received a total of K2.4 million. The Zambia Revenue Authority received K123.1 million for operations and expenditure on the pilot electronic fiscal registers programme. The programme, once fully implemented, is expected to improve domestic resource mobilization and help to create a sustained pool of the tax revenues needed to facilitate the financing of government operations and accelerate the implementation of development programmes. The Ministry of Community Development and Social Services received K45.8 million for the Social Cash Transfer Programme while the Public Service Pensions Fund received K88.3 million for payment of retirement benefits to former public service workers. The budget releases for the social cash transfer and pensions tally with government’s commitment to reduce vulnerability and inequalities among Zambians. January 2018 road sector funding drawn from road toll collections, fuel levy, and Road Traffic and Safety Agency fees and charges totaled K210 million. The funds were channeled to various road projects in line with the affirmation made in the 2018 Budget Speech to continue with Link Zambia, C400, L400, and rehabilitation and upgrading of feeder roads across the country – through rural roads connectivity. K112 million was released for the Lusaka Water Supply, Sanitation and Drainage Project under the Millennium Challenge Account, and K25.7 Million towards the Lusaka Peri-Urban Water Network Extension Project in cholera areas such as Kanyama, Mandevu, Chipata, Chawama, Bauleni, Garden, Chaisa, Ng’ombe, Chazanga, Garden House, and Kabanana Settlements. K1.8 billion was released towards debt service of which K629 million went towards servicing the domestic debt and K1.2 billion went towards servicing foreign debt. When asked to comment on this release of funds by the Treasury in January, 2018, Finance Minister Felix Mutati said by virtue of sharing the information, the Ministry of Finance looked forward to citizens participating in economic transformation programmes with open minds by taking greater interest in monitoring government financed projects in their localities through the relevant district and provincial establishments. “This is because, the successes which the economy is scoring through fiscal consolidation are not a twist of luck but a result of articulate reforms and the toils of citizens,” Mr Mutati said. “On a daily basis, citizens look for opportunities created by the government for business development. Therefore, “through citizen induced project monitoring, the government will be able to implement projects effectively and ensure that value for money prevails in state financed projects,” he said.smartphone. This article lacks direction bcoz the author does nt state whetha the amount in question is too high or too low or even okay. So tel us hw much you as the author thought should hv bn used in the fight failure to which you better keep quiet..!